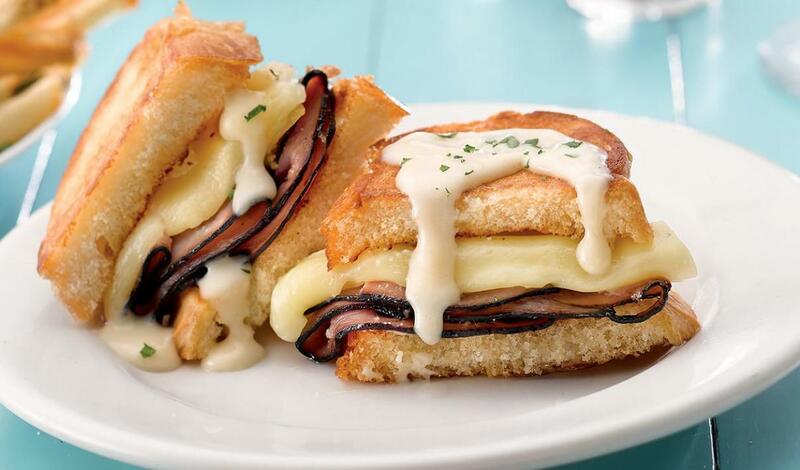 Ham, cheese and mustard grilled and topped with hot Mornay sauce perfect with Hellmann's® Mayonnaise. Combine the grated cheeses with the prepared LeGout® Cream Soup Base. Stir until the cheese has melted completely and the sauce is smooth. Season to taste with white pepper and nutmeg; stir in butter. Reserve. Spread the outside of the bread with Hellmann's® Real Mayonnaise. Spread the inside of the bread with Dijon mustard. Build the sandwich using Black Forest Ham and sliced Gruyere cheese. Griddle until cheese is melted and sandwich is warmed through. Spoon hot prepared Mornay Sauce over the sandwich and serve immediately.